are murdering the English language. Can the wind really be “calm”? Is “kudos” singular or plural? What does “unique” actually mean? What’s with “déjà vu? A rerun? That semi got a hemi? How should “protest” be pronounced? Podium or lectern? Stand on or at? Any difference between “celibacy” and “chastity”? Is it “number is” or “number are”? Is a “first annual” event possible? How is “kilometer” correctly pronounced? Is “comprise” the same as “compose”? Even though Amazon would love to sell you a Kindle, you can read I Hate to Criticize, But … without one using the free Kindle app for PC, Blackberry, Android, Windows Phone 7, iPhone, or iPad. 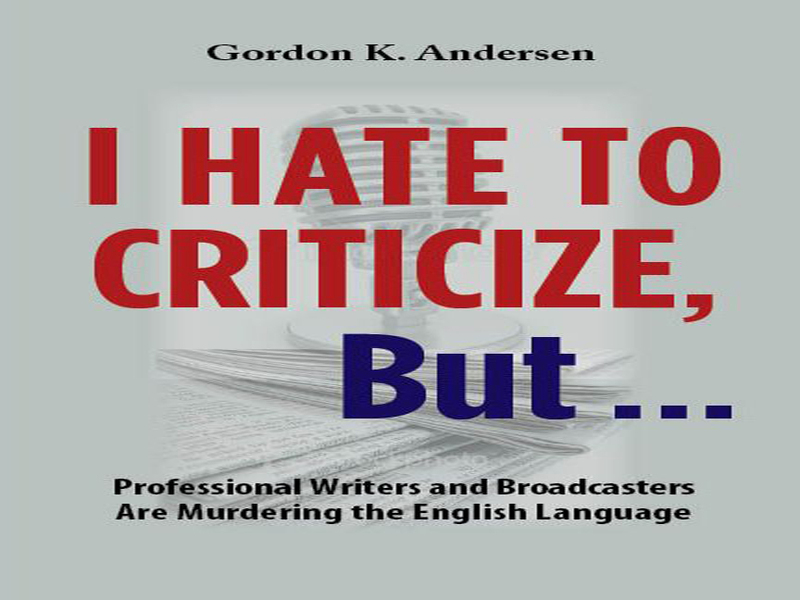 You'll also find a download link on the I Hate to Criticize, But … page on Amazon. I Hate to Criticize, But … is also available for the Barnes & Noble Nook in addition to the Kindle. Barnes & Noble also conveniently offers a free Nook reader app for the PC and several other devices. Rather have a printed copy?